The Vuelta has been heating up, with some technical finishes, late climbs, and a full-blown mountain top finish early in the three-week stage race keeping things interesting. The General Classification contenders seem to not have come to an agreement on the extent to which they will race aggressively. Stage 4, which finished on the high summit of Sierra Nevada, saw only Katusha’s Daniel Moreno and SaxoBank-Sungard’s Chris Anker Sorensen distance themselves from the group of race favorites – albeit after Vincenzo Nibali took an honest dig off the front on the long climb. The race failed to split apart – a sign that many were riding conservatively this early in the Grand Tour. Moreno – Stage 4’s winner – and his teammate Joachim Rodriguez argued otherwise the following day, as Moreno set up Rodriguez for a stunning attack up the obscenely steep poweclimb to Valdepeñas de Jaén. The Classics-esque parcours was more impressive as a stage win than an opportunity to gain time, but Rodriguez didn’t celebrate until after the line – a sign that he took the opportunity to gain as many prescious seconds as he could. Less than a week into this Vuelta and Katusha just may be salvaging their season – Moreno and Rodriguez pulling in back to back stage wins, wearing the Points and Mountains jerseys, and with Rodriguez high on the GC. A fine showing thus far after an anonymous all-Russian Tour. On Stage 6, Liquigas responded to Rodriguez with a late sortie of their own, leading the chase of a late breakaway over a Category 2 climb. Their kamikaze descending – a Nibali trademark – blew the race apart on a finish that could have easily been a sprint victory. Instead, the race shattered, with four Liquigas riders and Movistar’s Lastras, already with a stage win to his credit this Vuelta, pulling out a lead in front. 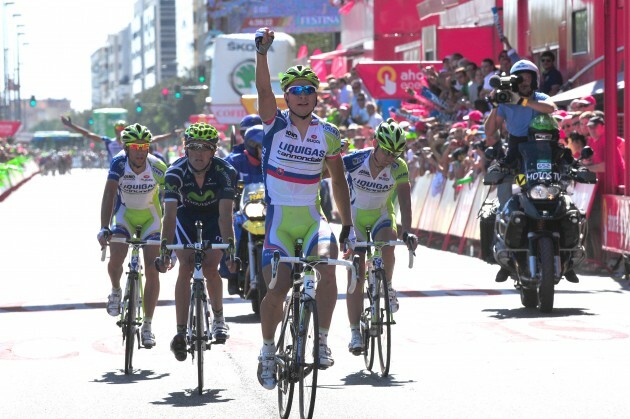 Liquigas played the stage to perfection by keeping the break within reach, pursuing on the downhill, and when gaps opened, keeping the pressure on all the way home – until the final 100 meters, however, when Liquigas looked disoriented, and Peter Sagan claimed the stage win over his faltering captain to prevent a heavily outnumbered Lastras from claiming the honors. Nibali and Liquigas as well as Rodriguez’s Katusha squad are racing this Vuelta very smartly. They know it’s not going to come down to a three-stage high-mountain showdown like the Tour did (though the Queen Stage on Stage 15, ending with the Angrilu climb, offers good terrain for fireworks). Rather, with disbursed, technically climbing stages spread early and midway through the Vuelta, combined with surprsingly few opportunities to reclaim major time in the last week of the race, this Vuelta may be won on snatches of seconds here and there. Thus Rodriguez’s win was particularly savvy, and Nibali’s fourth place this morning a potential failure. Halfway around the world, the US Pro Cycling Challenge is well underway, with a fast downhill time trial and two mountainous stages resulting in the young Tejay Van Garderen taking the leader’s jersey from the previous day’s stage winner Levi Leipheimer as George Hincapie outsprinted a small group on Stage 2. With a mixture of seasoned European racers, fatigue from the Tour de France, and hungry lower-level professionals, the USA Pro Cycling Challenge and it’s hilly parcours at an altitude that has caused much difficulty (expressed profusely through the Twitter accounts of your favorite pros), we think this race is still anybody’s game. Pave editor-in-chief Whit Yost grades some standout riders on their performance thus far in a feature for Bicycling Magazine – go on over and take a look. This entry was posted in Featured, Races and tagged hincapie, leipheimer, moreno, nibali, rodriguez, usa pro cycling challenge, vuelta a españa. Bookmark the permalink.